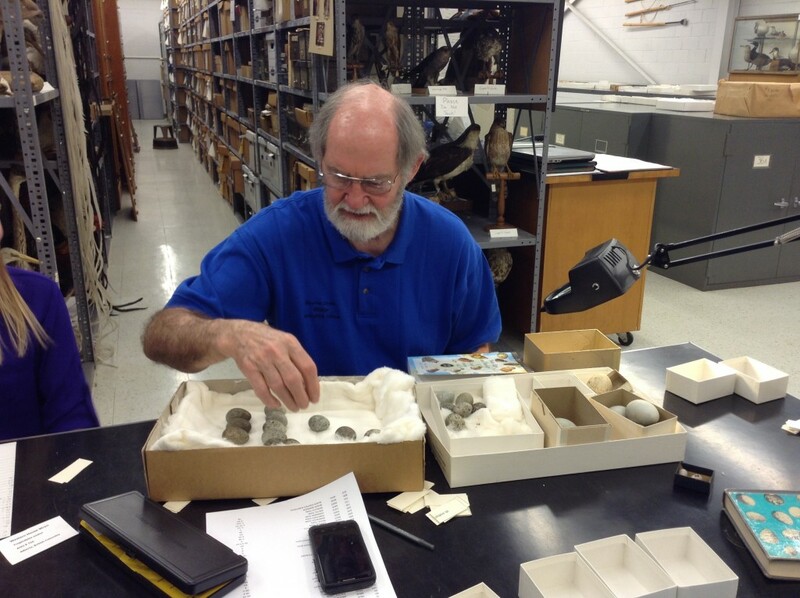 Tetrapod Collection: What Happens in a Collection? A collection is nothing without people who use it. 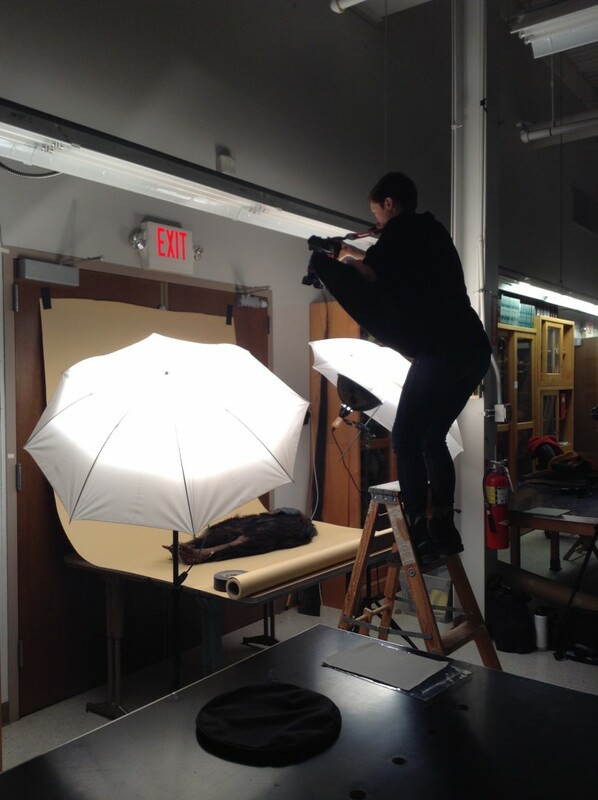 Our collection sees constant use by students, artists, researchers, experts and more. 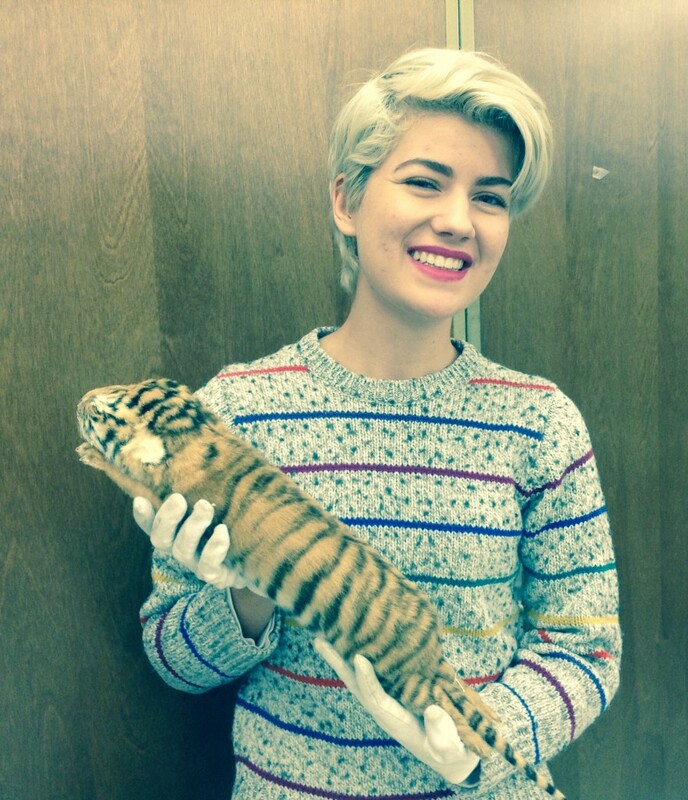 We conduct tours, workshops, and projects within the collection, all involving people who desire to learn more about some animals and find these in our collections. None of this would be possible without a community around us, who want to learn and appreciate all the collection has to offer. 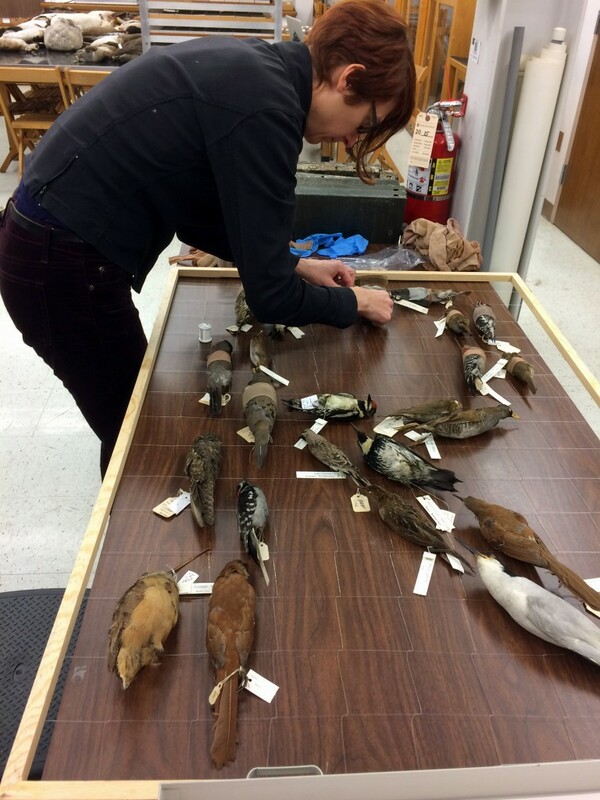 Help us maintain our specimens and check out our campaign! We are raising money for a new mobile cabinet for our endangered and extinct species. Please spread the word about our campaign and and donate today! 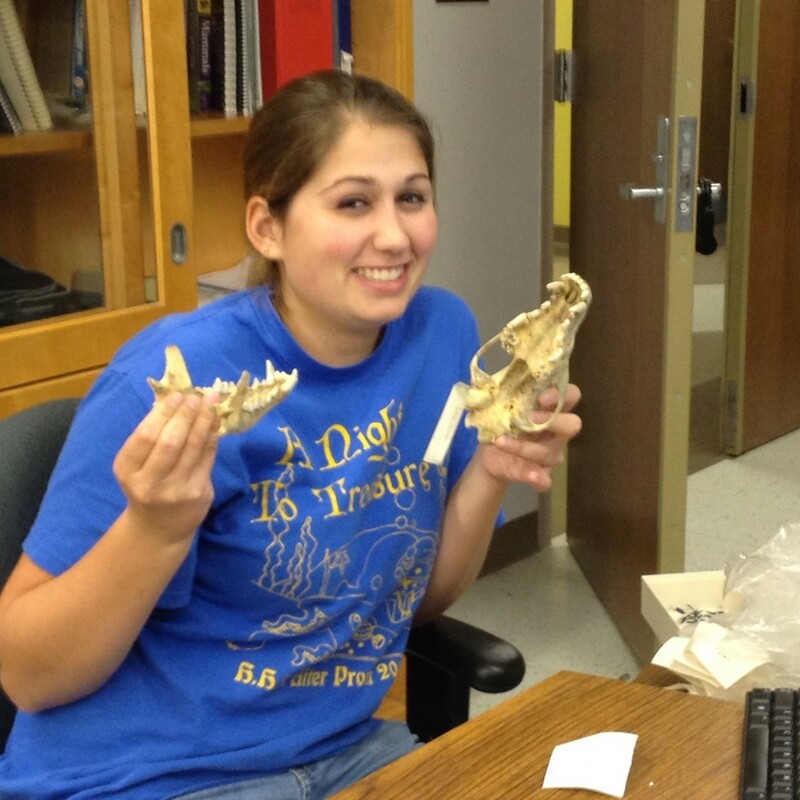 A student shows off a coyote skull. 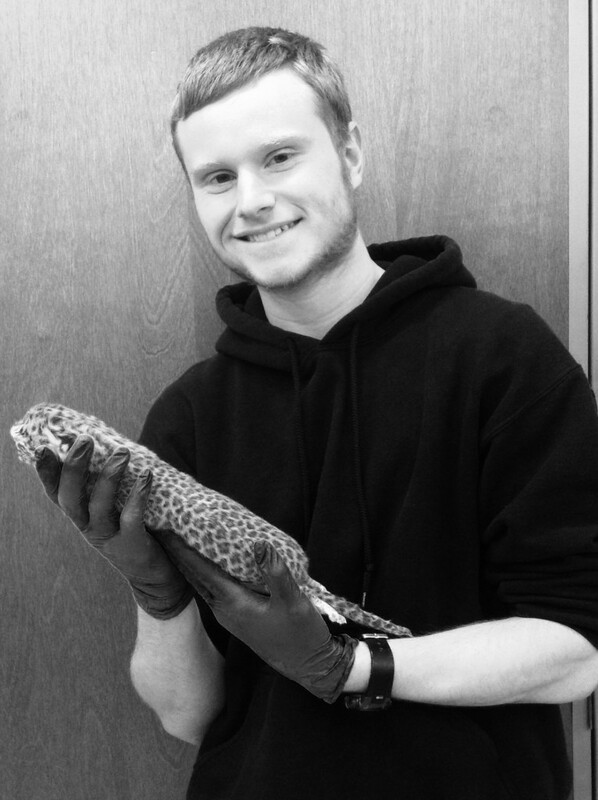 A volunteer holds one of his favorite tetrapods. 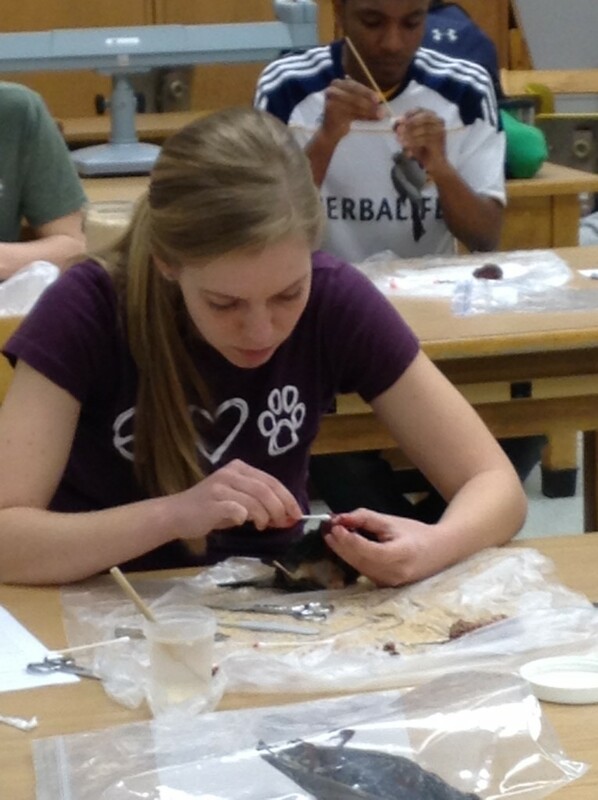 A student focuses on the bird skin she is preparing. 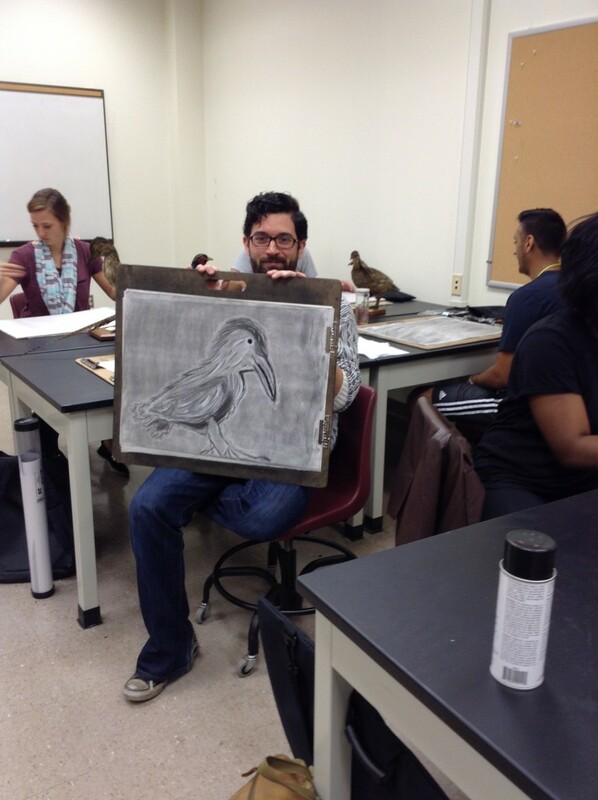 An art student shows off his drawing of a mounted specimen. An artist takes photos of the bison cabinet. 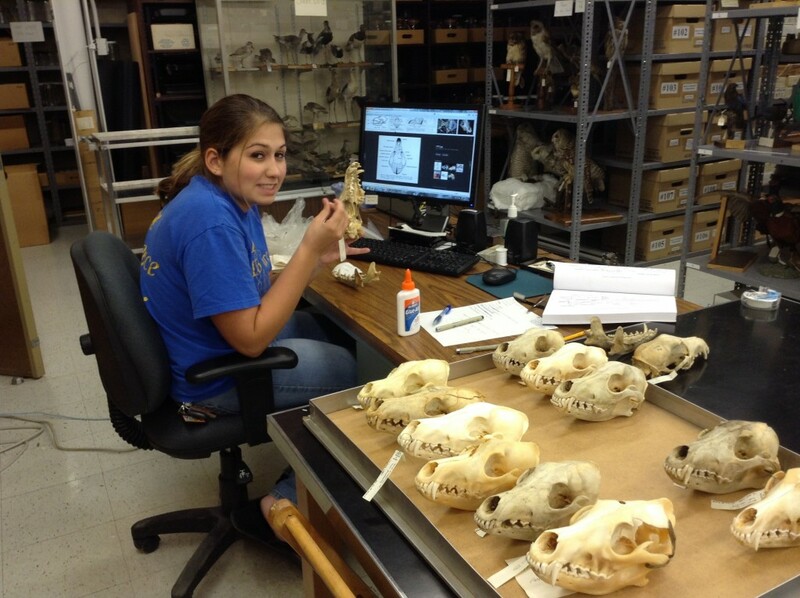 A student helps with identification of mammal skulls – which one is not a coyote? 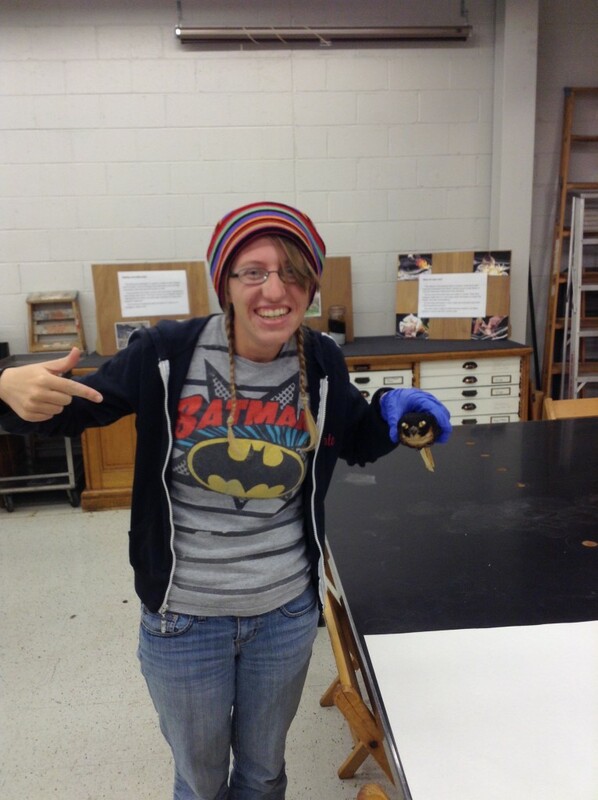 The collection manager showing off a Bat Hawk. SENR Scholars tour the collection. 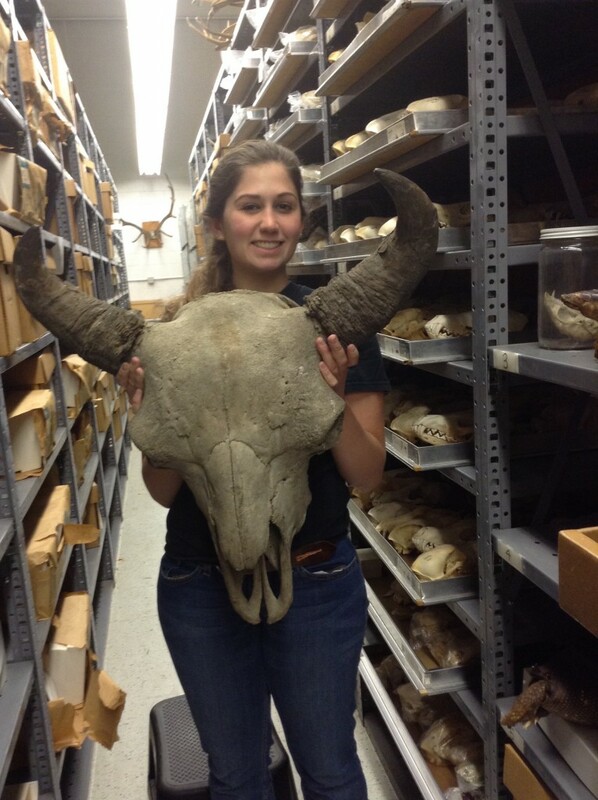 A research assistant shows off the size of a bison skull. 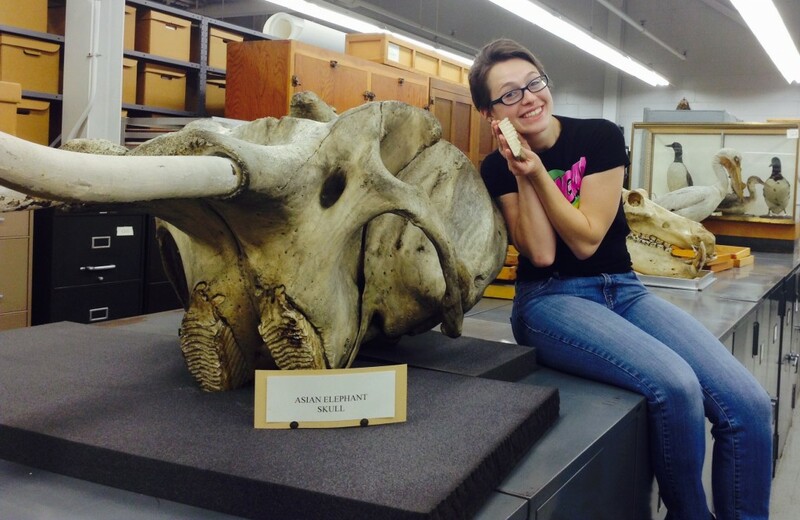 A research assistant shows off a tooth next to the elephant skull. 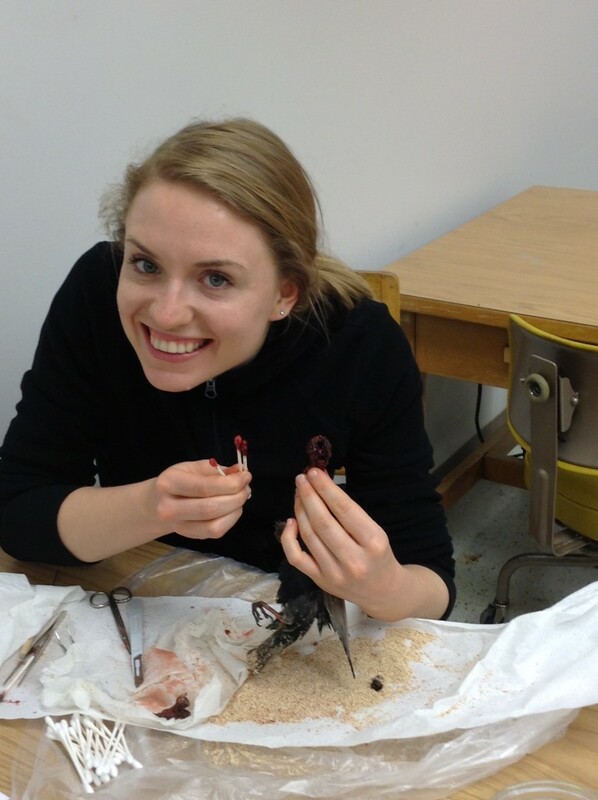 A student shows off a bird skin she is preparing. 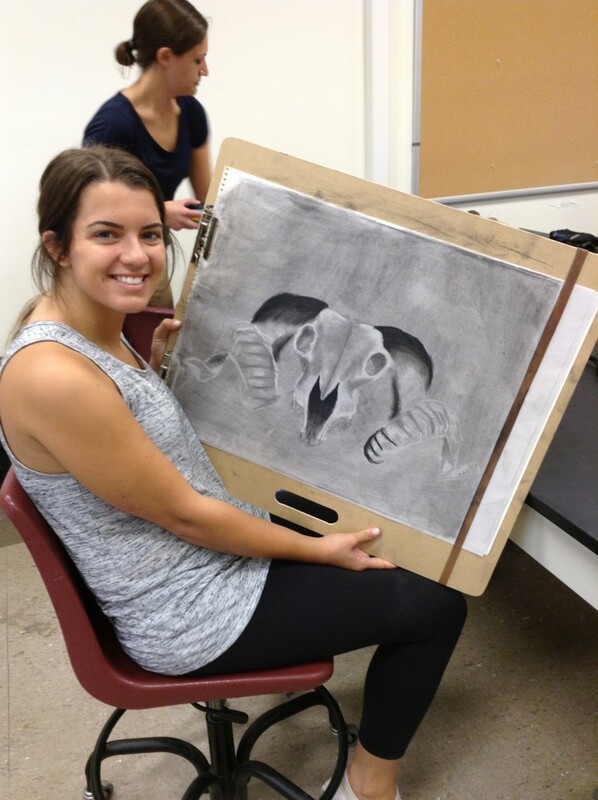 An art student shows off her drawing of a skull. Experts photograph various clutches of bird eggs. 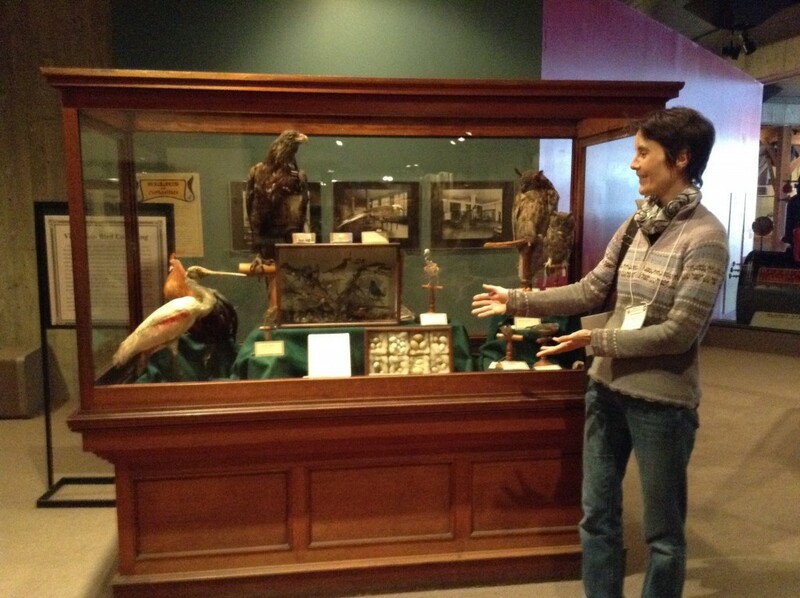 Some of our specimens go on display at other places, here at the Ohio History Connection. 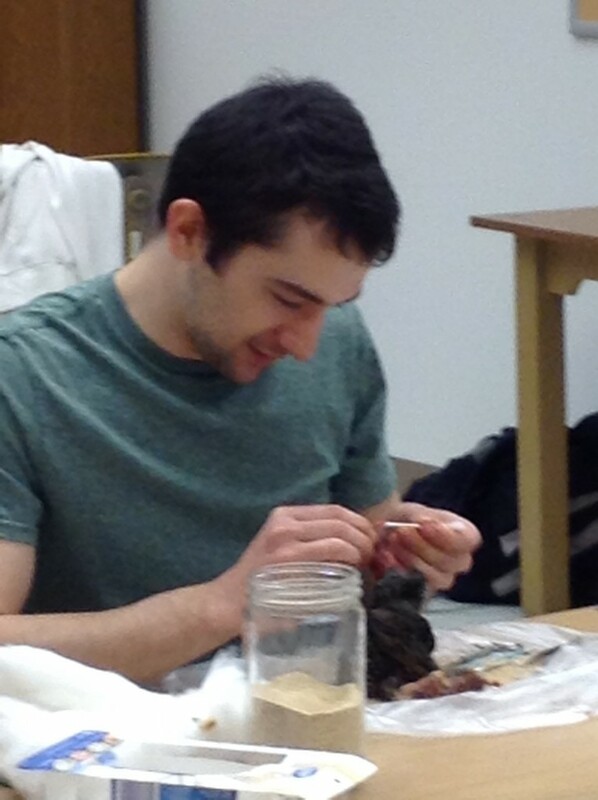 A student cleaning a skull in the preparation lab. Students in anticipation of visitors for our Annual Open House. 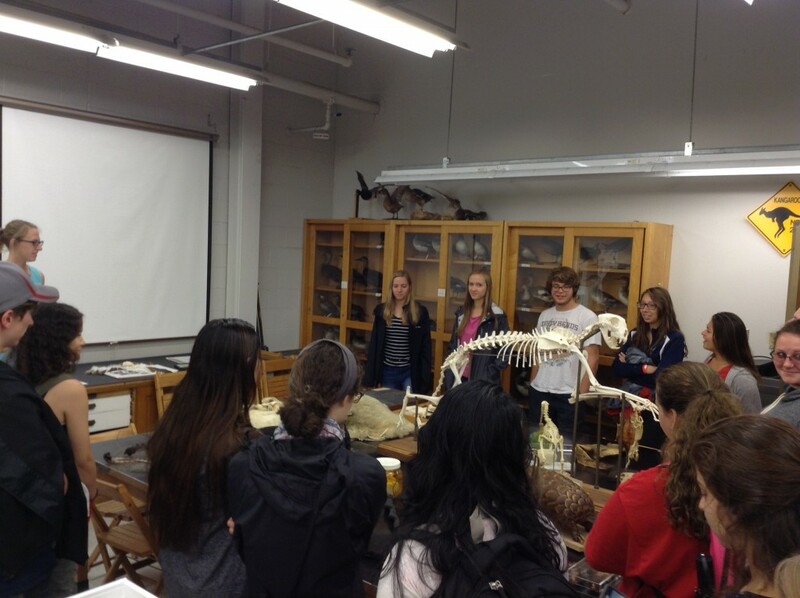 Student’s look at articulated skeletons during a collection tour. An artists takes a different view of a cassowary. An expert identifying clutches of bird eggs. 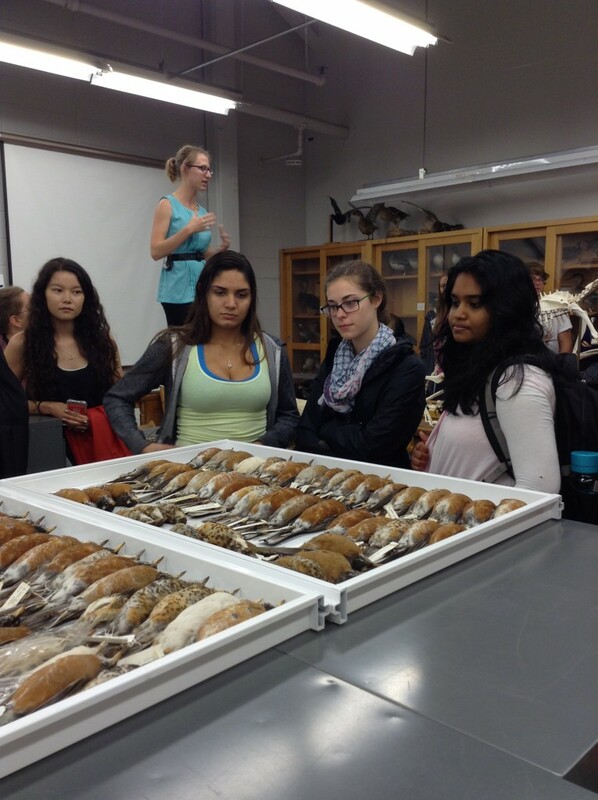 Students view American Robins during a collection tour. 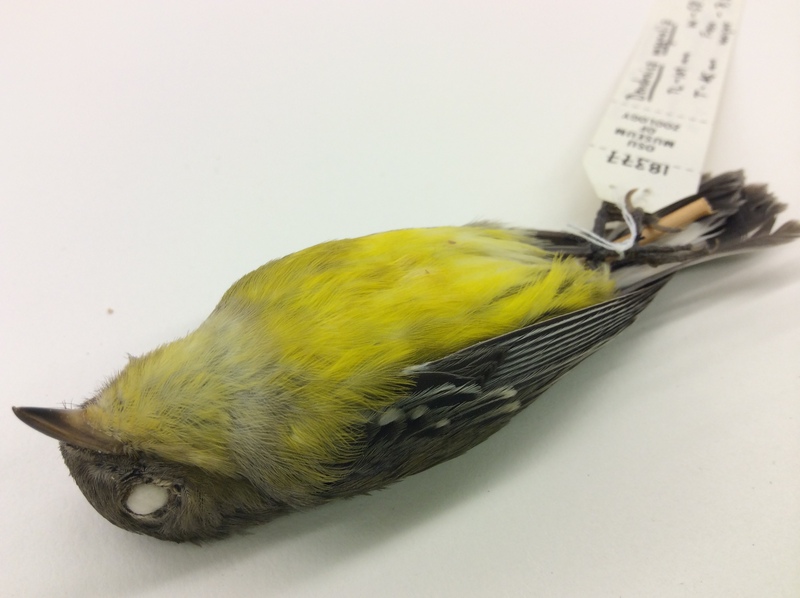 How can museum collections help us understand bird migration? Millions of birds migrate south every fall. You may have noticed some recent changes in your backyard bird community. Most of our summer residents have left by now, Tree Swallows and Eastern Bluebirds will be back next spring. Some birds will not succeed on their long journeys, because we have put up many obstacles for them to overcome, such as buildings with clear, shiny windows. Birds try to fly right through them. 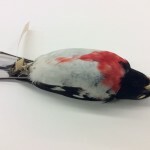 Thousands of volunteers like you pick up these window-killed birds and take them to their local natural history museum. We prepare them into specimen skins and preserve them for future research. Over the years these specimens paint a picture of certain routes particular species take, the timing of their migration etc. We have learned that not all individuals of a species migrate at the same time, often young birds migrate later than adults, females differently from males. To find out when to expect migrating birds in your area visit the Black Swamp Bird Observatory. 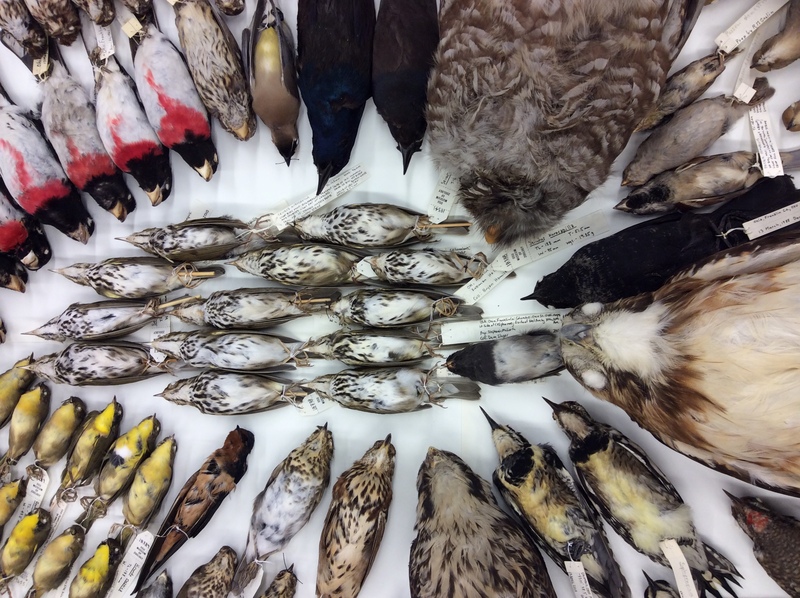 We can learn so much from our museum bird skins and studies will help us make migration safer for today’s birds. Sometimes birds get blown off track on their long journey and end up in an unusual location. 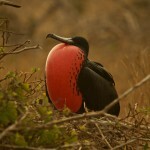 With so many bird watchers today, these birds usually stir quite a bird watching frenzy. 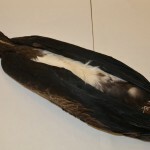 In the past some of them have ended up in our collection like this Magnificent Frigatebird that Milton Trautman collected in Morrow county, Ohio on October 2nd in 1967, almost 50 years ago. Natural history museum across the country help with these efforts. Read about this student’s project “What can we learn from 30+ years of bird migration data?” at the Field Museum in Chicago. 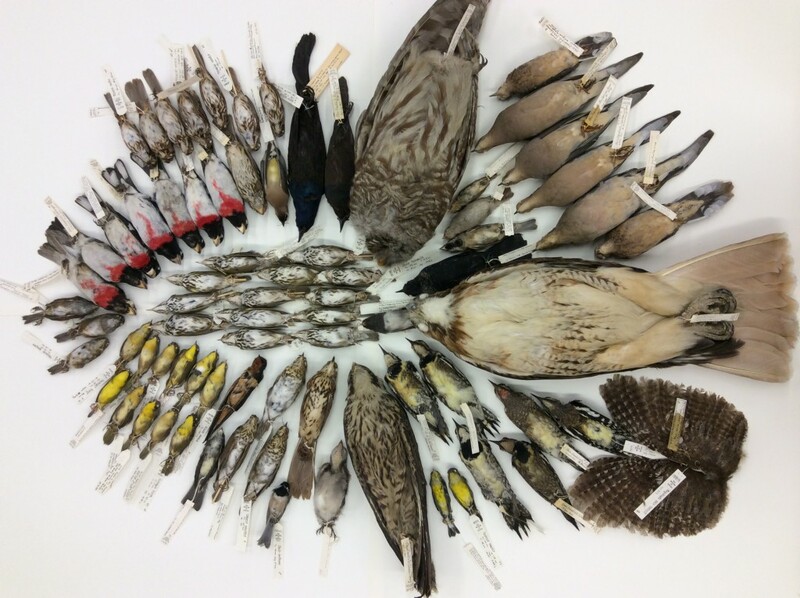 Before you get involved you may want to read this testimony from volunteers at the Field Museum who collected and prepared many of the specimens for the above study. 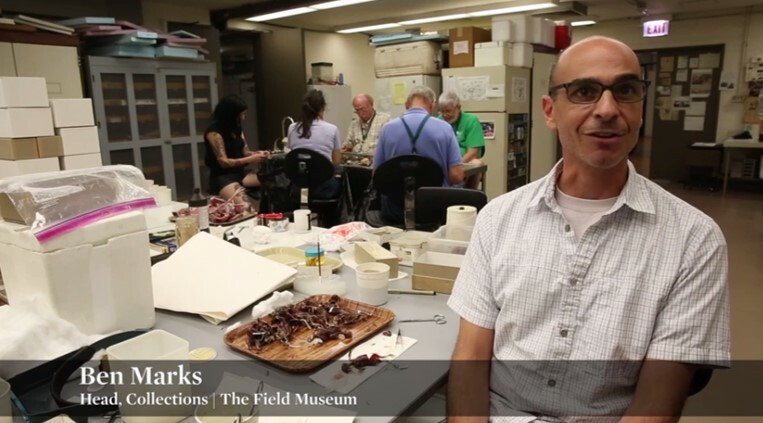 Part of the Tetrapod collection holds preserved reptiles, most of which represent native Ohio species along with several species from other parts of North America. To find a Species of the Month, I ventured down the aisles of shelves with jars of snakes, lizards, turtles, and tortoises. When I saw this Timber Rattlesnake, one of our collection’s most impressive reptilian specimens, I made my choice. I chose an animal that is feared, and misunderstood, by many. Attaining an average length of about 3-4 feet, the Timber Rattlesnake (Crotalus horridus – a frightening name for an animal that rather avoids than seeks conflict) is a fairly large snake. Like most snakes, Timber Rattlesnakes are feared by a lot of people who don’t understand them well enough. It’s important to remember that snakes such as the Timber Rattlesnake don’t seek out conflict with humans, but rather try to avoid it. A part of the fear people have for snakes comes from common misconceptions, which these facts below will hopefully clear up. 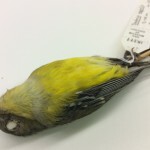 Their range stretches throughout most of the temperate forests in the Eastern United States and Canada, however they can no longer be found in Maine and Ontario. Here in Ohio, they can really only be found at the southern end of the state. Timber Rattlesnakes will mate during the spring and fall with the females giving birth to anywhere from 4-14 young during the late summer. What’s interesting about rattlesnakes (Timbers included) is that they give birth to live young, which is very unusual for a reptile. Many reptiles, just like birds, usually lay eggs from which their young hatch after some incubation time. When the snakes feel threatened, Timber Rattlesnakes will rattle their iconic tails as a warning to potential predators that get too close. 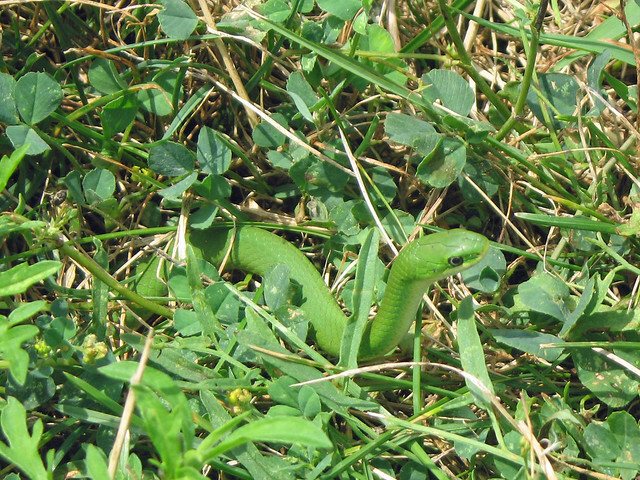 These snakes eat a wide assortment of small mammals and can sense their prey using special heat sensory organs that are located on their heads. These sensory organs are known as loreal pits and are a characteristic common to all members of the pit viper family, which includes rattlesnakes. When Timber Rattlesnakes deliver a bite, deadly venom will be injected through the snake’s hollow fangs and into the victim. A common misconception is that snakes are poisonous; when in actuality they are venomous. Venomous organisms directly inject venom into the victim whereas poisonous organisms have a poisonous substance covering their body making them dangerous only when eaten or touched. Learn more general facts about Timber Rattlesnakes from an Ohio Certified Volunteer Naturalist. Quite a bit of research has been done on these snakes, a few years ago Rokyta et al (2013) reported that components of their venom seem to have changed. Some species of snakes (Timber Rattlesnake included) have undergone a dramatic shift in the lethality, and composition of the venoms they produce. Traditionally, Timer Rattlesnakes produced a hemorrhagic type of venom, which causes the snake’s victims to bleed to death from the inside out (visit the Snakes and Spiders web site for a full description of how snake venom works). However, this study shows that, at the southern end of their range, Timber Rattlesnakes are beginning to develop a bite consisting of neurotoxin venom. Neurotoxins attack the victim’s central nervous system resulting in cardiac arrest and trouble breathing thus making it much deadlier than hemorrhagic toxins. 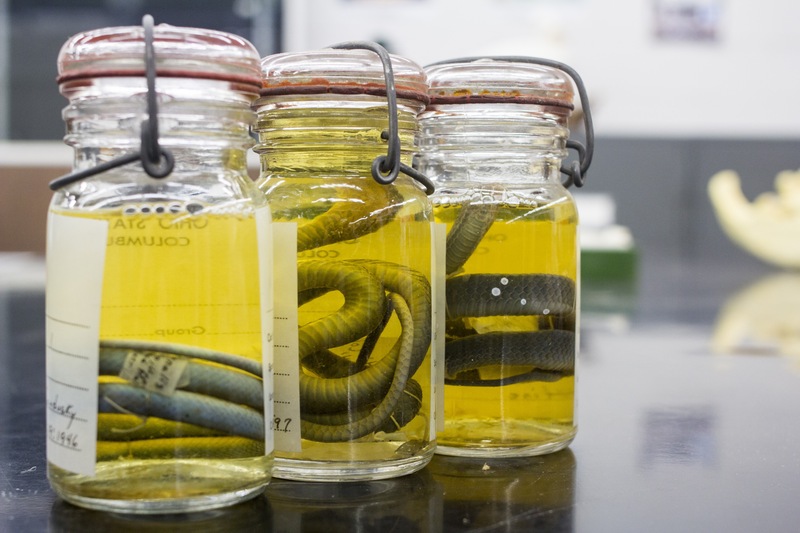 Similar research on the evolution of snake venoms is being done at the molecular level by researchers in the Gibbs lab here at OSU. Timber Rattlesnakes are amazing animals that encompass both beauty and lethality. Their status as a top predator has even landed them a place in history as the species of snake that appears on the “Don’t Tread on Me” flag. While these are highly venomous creatures, it’s important to remember that they just want to be left alone and do their best to avoid conflict with humans. Should a Timber Rattle snake bite you or someone you are with then please follow the procedures outlined by the Wild Backpacker to ensure a safe and speedy recovery from any venom related injuries. If you ever encounter a Timber Rattlesnake NEVER try to approach or pick it up, instead leave it alone and in turn it will leave you alone. Timber Rattlesnakes remind us that sometimes it best to admire natural beauty from a distance. “Understanding Snake Venom and How It Works.” Snakes and Spiders, 3 Nov 2009. Brown Bats and Red Bats and Myotis Oh my! An evening walk, in search of the Ohio State University’s only flying mammal, the bat. BioPresence and the Museum of Biological Diversity’s Tetrapod Collection presents an evening with Count Dracula’s counterpart and the only flying mammal found in the world, the bat. Come learn more and follow around some of Ohio’s most unique and fascinating mammals. With the use of a bat detector we will be recording what species we are finding and documenting as much of the local campus bat life as possible. All are welcome: Bat Walk will occur Tuesday August 25th 2015 at 8:15PM and meeting location to be announced closer to event. If I said that I had planned to work at The Ohio State University’s Museum of Biological Diversity from the beginning of my college career, I’d be lying. If I said that I was aware of the museum’s existence before last October, I’d still be lying (I know. I’m just the worst). 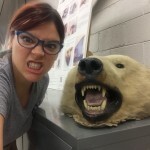 If I were to spin a yarn about how I first got started at the museum, it would begin last semester when I was frantically searching for an undergraduate research position. As a zoology major entering my third year of college, I thought to myself, I should probably start getting zoology work related experiences to put on my resume and undergraduate research seemed the most appealing. The problem is that Sasquatch is easier to find than a professor doing zoology-related research and who is looking for an undergraduate to participate. So after much searching, emailing, crying, etc… I asked the undergraduate research office where I could go to find said professors looking for undergraduate workers. 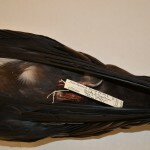 They replied that most of researchers could be found, or have an office at the University’s Museum of Biological Diversity. Upon hearing this, my initial thought was, “We have a Museum of Biological Diversity?” My second thought was, “We have a Museum of Biological Diversity and I’m just hearing about this now?” I took a bus out to Carmack Corner, walked up a dirt road and found this place on the very edge of the University’s land. When I first discovered the museum, I was so incredibly intrigued and excited about what could be inside. Upon further investigation however, I was incredibly disappointed to see it wasn’t an “actual” museum but more akin to the warehouse from the end of Raiders of the Lost Ark. 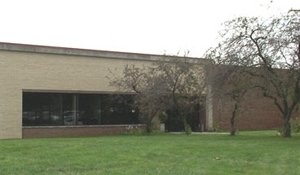 There is the building in all its glory. When I say that this museum is out of the way, I mean it is really at the far western end of campus. 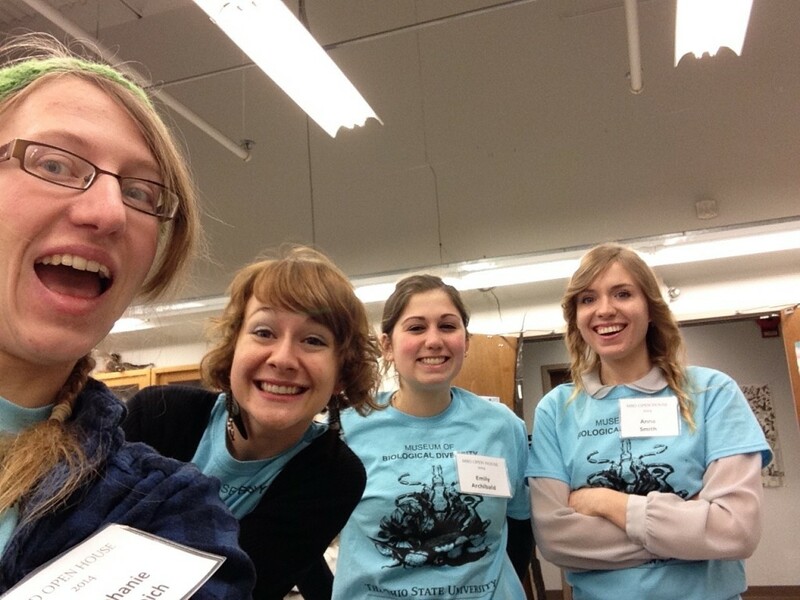 It wasn’t until the beginning of this semester that I had heard about the museum’s annual open house. I had been told that this is the one day of the year that the museum resembles the general public’s view of what an actual museum rather than a warehouse, so I decided to attend. 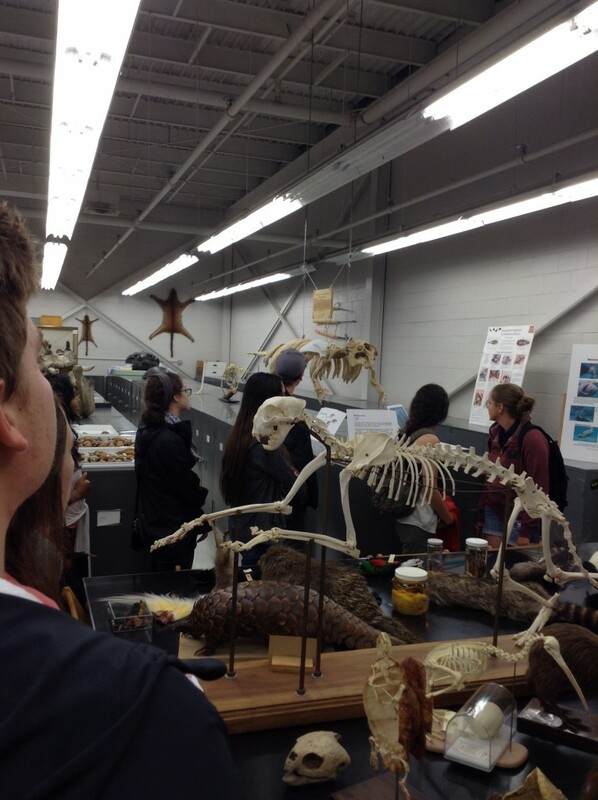 The open house was a wonderful experience for a zoology major, such as myself. After entering the building, I was soon surrounded by specimens of exotic and colorful birds and skeletons from a wide variety of different animals. After seeing all this awesome stuff, I thought to myself, “Gosh wouldn’t it be just swell to work/intern/volunteer here?” So I had met with the curator, Dr. Angelika Nelson, and began to volunteer my time labeling and organizing specimens in the museum’s Tetrapod collection. So it’s been a little over a month since I started at the museum (I refer to myself as a freshman for a reason) and now I have a chance to really look back and reflect on what I’ve done so far. All that I’ve really done (again, I’ve only been here a month) is print labels, organize loans, do some geo-referencing and maybe (if I should be so lucky) count how many 100-year old hummingbirds we have in our collection. Make no mistake; museum work is not for everybody. At times it can seem like long, tedious and mind-numbingly boring work. But I love every minute of it. I’m sure that if the average person were to come to the museum and try to do what it is that we do there, they’d either recoil in disgust or fall asleep from boredom. And that’s fine, it’s not everybody’s cup of tea. For me however, working at the museum is one of the greatest jobs I’ve ever had. 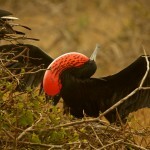 Animals, in general, just wholly fascinate me and I grew up watching the old Animal Planet. When I printed labels for specimen cabinets, I got to look at some of the most exotic and unique bird species I’ve ever seen. 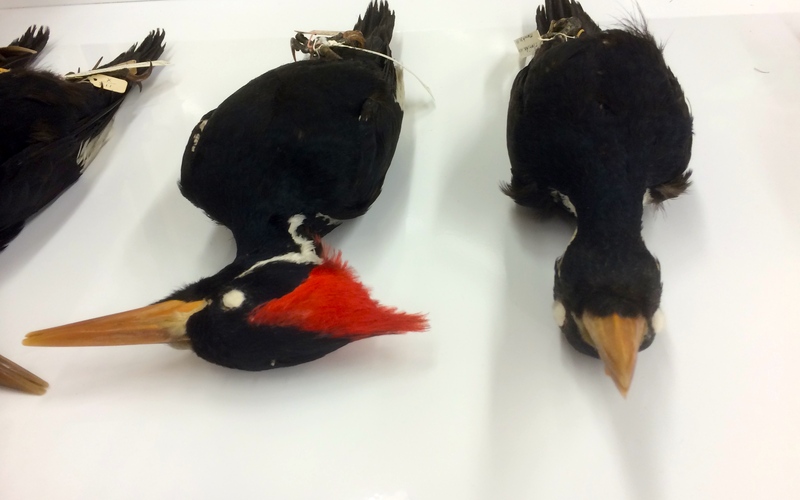 Not to mention that I got to touch three of the endangered bird species the Tetrapod collection possess: an Ivory-Billed Woodpecker, a Passenger Pigeon and a Carolina Parakeet (I can die happy now). Working there is basically nirvana for a guy like me. Not going to lie… These are the most exciting specimens I have seen so far. While working at the museum is incredibly fascinating and fun, I’d be lying (again) if I said there was only one reason why I love it there. 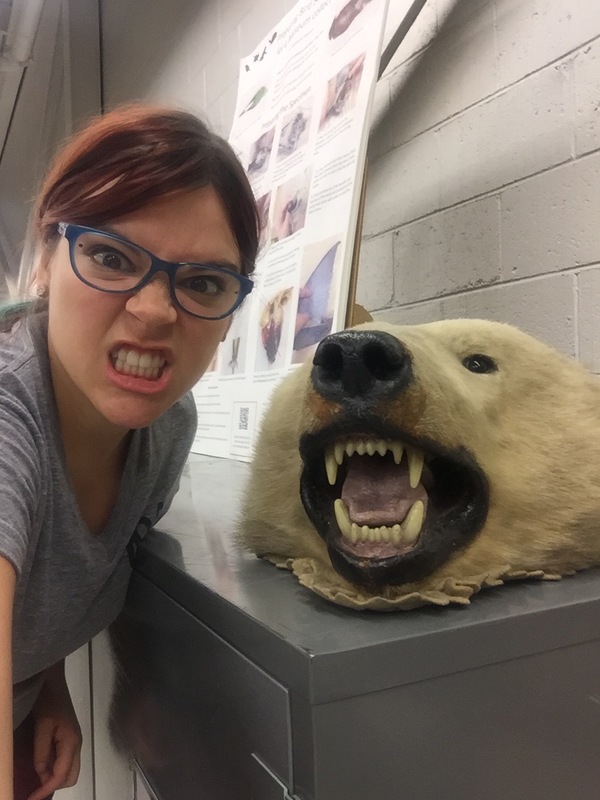 Going into the museum and doing all this science-related work makes me feel like I’m getting closer to actually being a zoologist. For anyone who is a zoology major at OSU, I don’t need to tell you how difficult the major program is. I spent the first two years of college trying my absolute hardest just to get through the math requirements (don’t even get me started on that ungodly chemistry program). So working here (along with actually doing major courses) makes me feel as though I’m becoming a “big kid” in my field. I’ve often said that the greatest decision that I ever made was joining the Boy Scouts. However, I think I may have topped myself by choosing to work at this museum. I love the work that I do in the Tetrapod collection and it helps me feel as though I’m actually doing something worthwhile with my time. If you’ve enjoyed reading about my experiences, then you’re in luck. My latest responsibility for the museum is to write more of these blog posts, so the fun never has to end. Until next time dear reader. 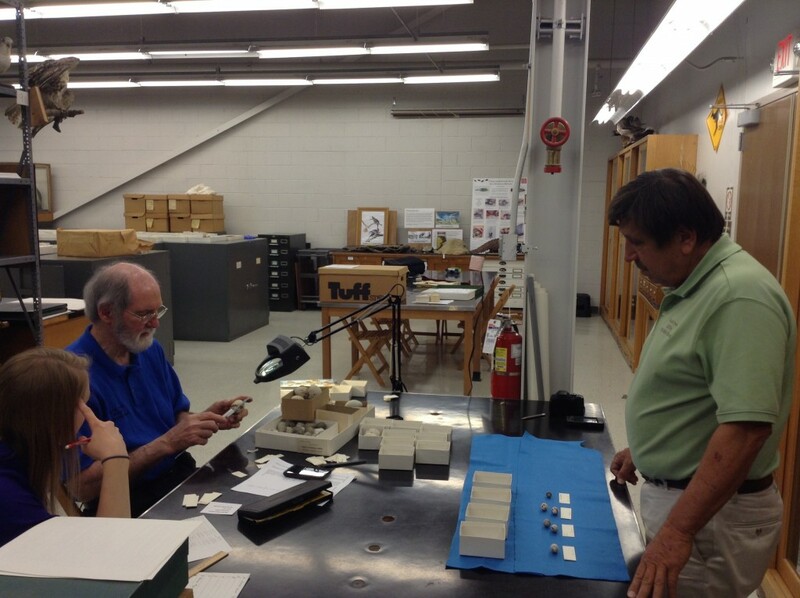 Raymond is one of our newest volunteers in the Tetrapod Collection who will be interning with us this coming fall. 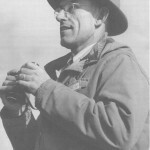 His current projects here included working with our amphibian and reptile collection. Emily Archibald, an Evolution and Ecology major, has been mainly interested in the mammal collection and is re-organizing our many coyote skulls for teaching and research. 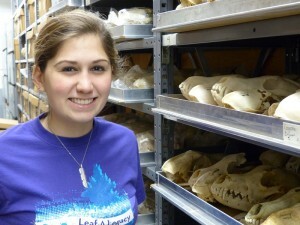 Stephanie Malinich graduated from OSU last spring, but she discovered her love for museum work as a student. She has been back as the “bird-skinner in-charge” since September. 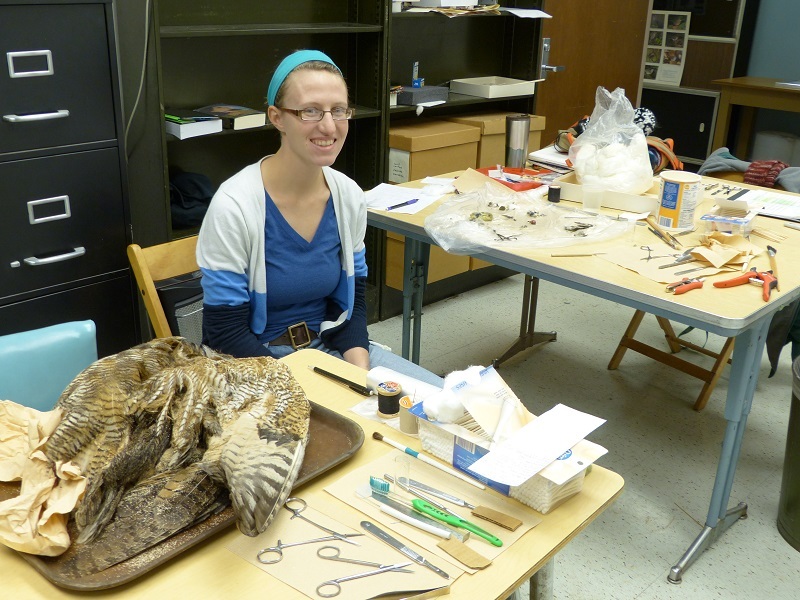 Stephanie has learned how to prepare museum study skins through some workshops with Dr. Jackie Augustine at the OSU Lima campus. She is always looking for new challenges, her newest project: preparing a skeleton of a Red-tailed Hawk with one spread wing. Rebecca Price, a Zoology major, has come to the collection as a volunteer. 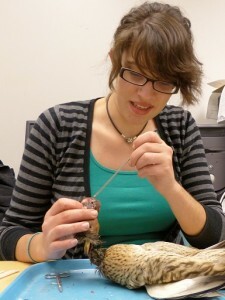 She has since taught herself the skill of bird study skin preparation and is now working together with Stephanie. 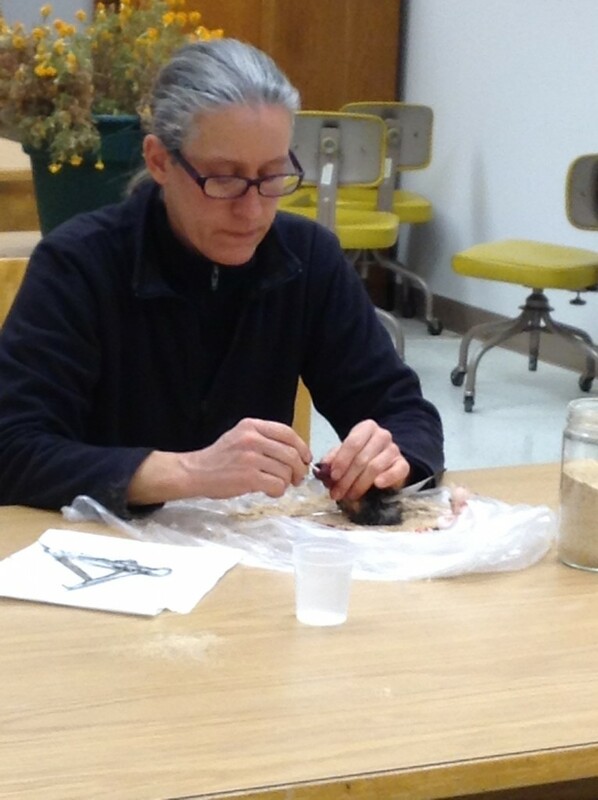 Just recently she prepared a Pileated Woodpecker! 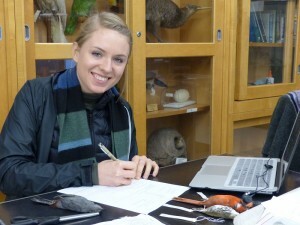 Anna Smith, a Molecular genetics major, discovered the tetrapod collection as a volunteer for our Open House last year. 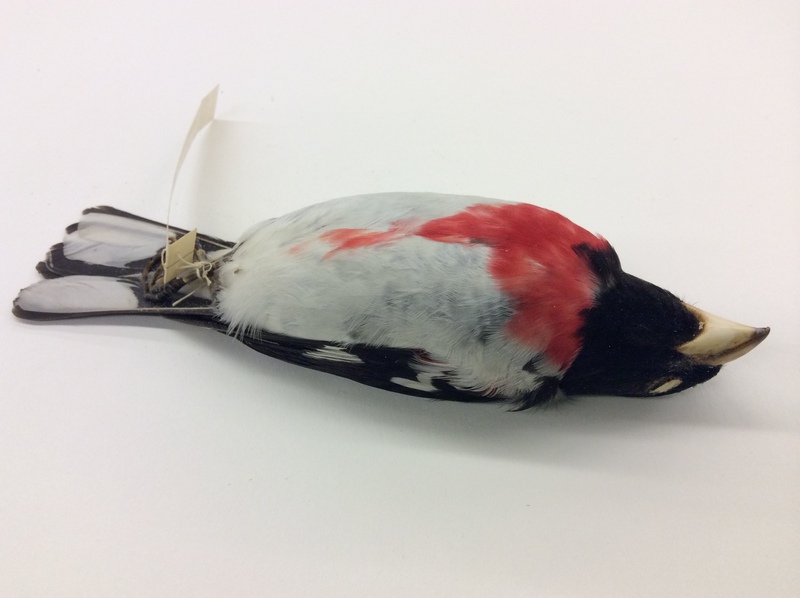 She has since re-organized the mammal teaching collection, labelled many skulls and bones as well as newly prepared bird skins.